OK, it seems the process of catching up is not over yet. This is a game report of a game we (Julian and myself) played in May. 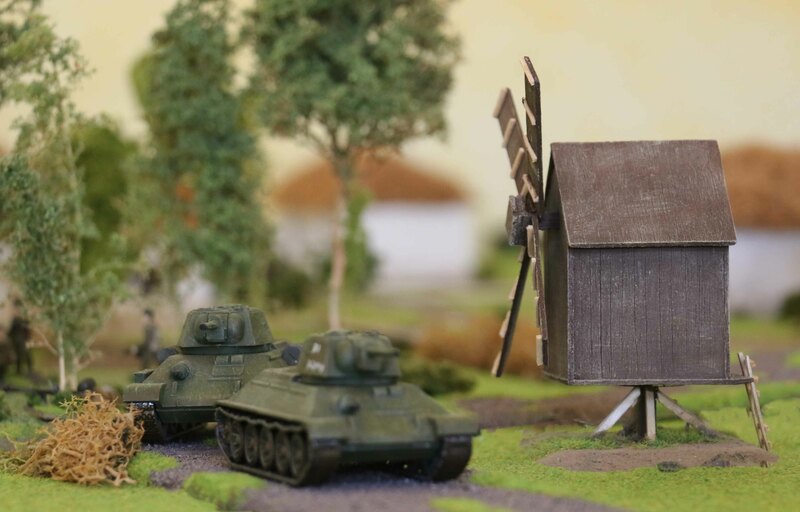 This time it was Battlegroup Kursk (in 20mm). The scenario was the “Counter-Attack at Vinogradovka”, but with alternative forces. Before I start, please let me say, that it seems I have waited a little too long writing this report, since my memory seems a little fuzzy by now. Be that as it may, I will try to give my best report. 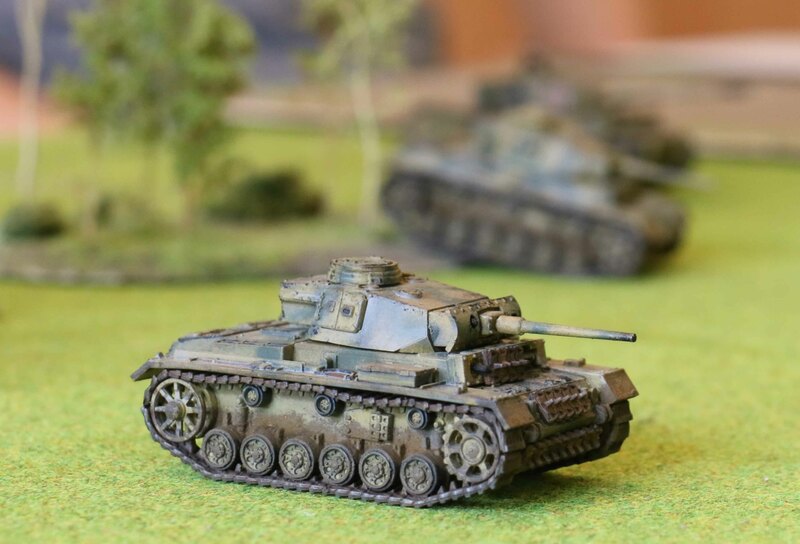 The Germans (played by Julian) had a PzKw V Tiger, three PzKw III, accompanying infantry (if memory serves me right, about a platoon of them) and some off-board artillery. The tanks were deployed on their right, the infantry in the centre and on their left (where the majority of their infantry was. 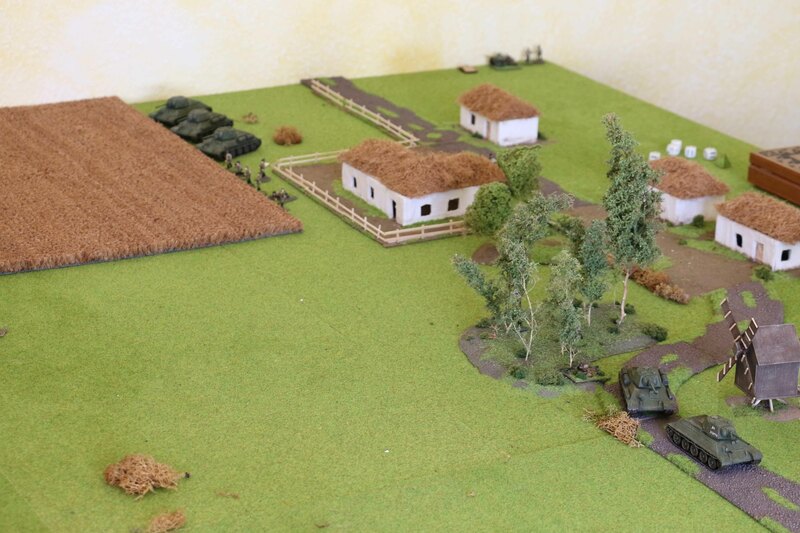 The Russians (played by me) brought 6 T34-76, three T-70s, two guns (IIRC a Zis-2 and a Zis-3), two medium mortars and infantry (again about a platoon worth plus a sniper team) to the fight. One three tank group of T-34´s each were deployed centre and right, as was all the infantry. Only the T-70s were deployed opposite the German tanks. Throughout the game, the Germans only rolled average when it came to the number of commands per turn. That being said, with one exception, the Russians rolled very low. Almost from the start, the game turned into a heavy slugging match. The Germans activated first and pounded the Russian positions with their artillery and Tiger (since all other weapons were without range). 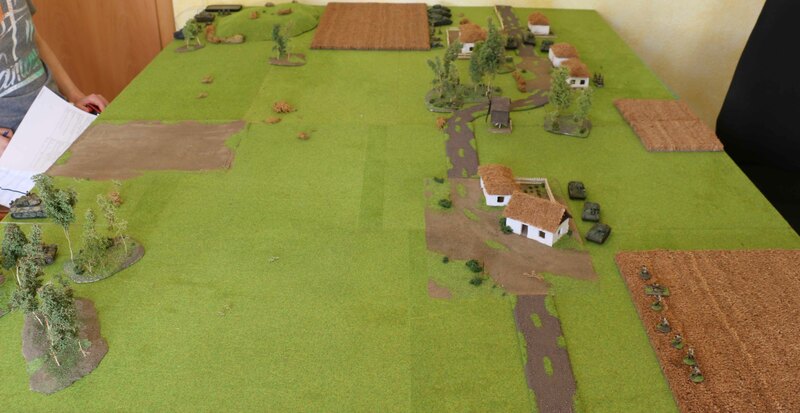 They failed to do much damage to the infantry and gun crews they hit (IIRC only one dead), but two infantry sections and one of the AT guns were pinned. Some of the German infantry advanced as well. The Russians returned fire with the other AT gun and the T-70s, firing at the PzKw IIIs, but the most they did was pin one of them. 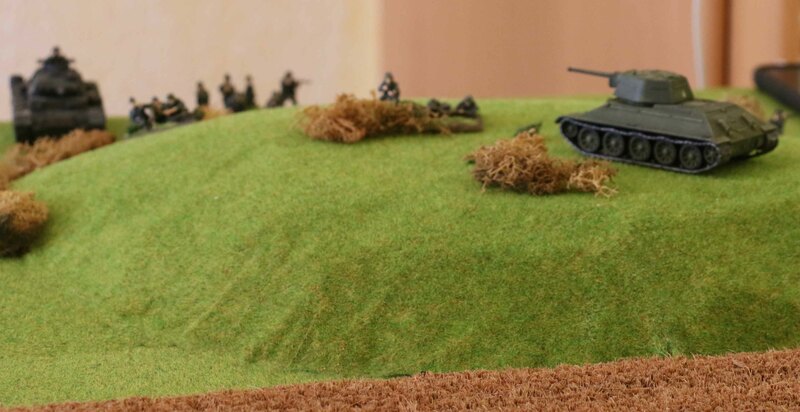 The T-34s in the centre started their advance towards the German tanks. At the same time the Russian that had been pinned by the German fire unpinned. 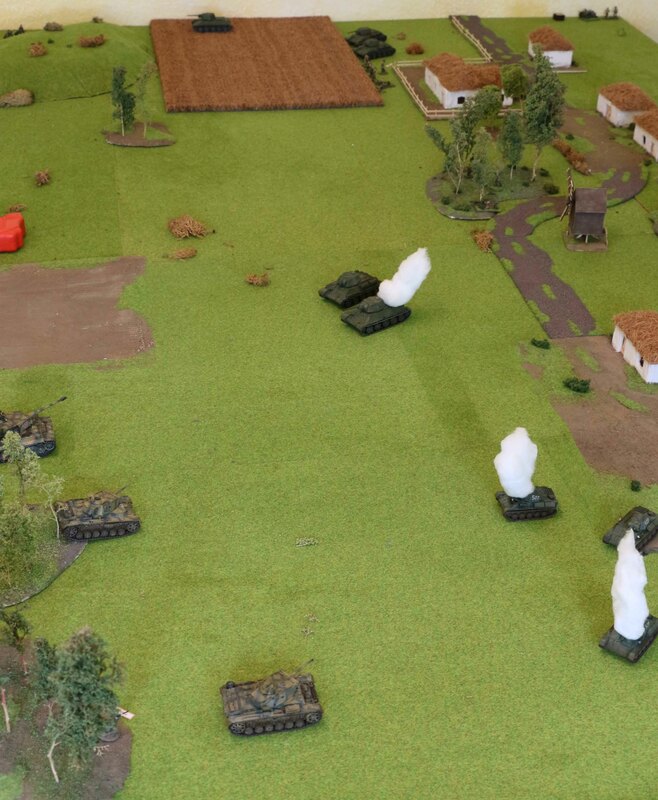 From this point on, things turned more and more into a gunfight between the tanks of both sides and the AT guns. Both the T-70s and PzKw III died pretty quick. The biggest problem was the Tiger. It slowly kept on taking out the T-34s. It is not like they did not fire back, but all they did was pin it from time to time. So by the end of the game, all that was left from the tank battle was the Tiger. On the only thing that went somewhat well for the Russians was their right flank. Although they were subject to heavy fire and close attacks from the German infantry, they managed to dislodge them from the hill on that flank. Even better they also managed to take out the German spotters, which meant no more artillery coming down on their positions. In the end it was too little though. I managed to always draw the high chits when unpinning or taking losses. So by the time they cleared the hill, the Russians had taken too many losses and had reached their breaking point and the Germans won the day. All in all a very pleasant game, that was somewhat diminished by the bad dice rolling whenever it really mattered!